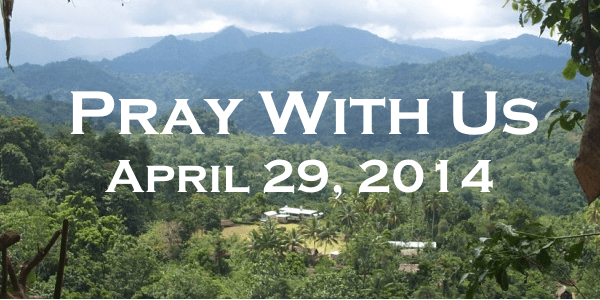 Please Pray–April 29, 2014 | You Can Shake the Gates! Please Pray–April 29, 2014 – You Can Shake the Gates! Imagine being stranded on a desert island in the middle of the south seas. You find two crates ashore. One contains three years’ worth of MRE’s (Meal-Ready to Eat: self-heating, preserved complete meals). The other crate contains only Bibles. Do you think you’d have any idea that 1) the Lord would send a rescuer to his people? 2) that the rescuer would not be a political rescuer, but one who would rescue people from death itself? 3) that this rescuer would restore the relationship clearly broken between Adam and all his descendents and Jehovah? The imagery used here reveals generosity, compassion, commitment, and ability to right our wrongs and restore to perfection what was broken by our sin and rebellion. He even goes so far as to get involved personally–swallowing up death. Death! What smothers all of mankind our Father is able to remove! Hallelujah! Furthermore, He has spoken to us by His Word and His Word is final. Death is removed, its sting no longer potent. Please pray with us with this aspect of God’s character firmly in our spirits. Ask God to open the eyes of the Somau Garia speakers who do not know him to the reality that He alone can take away their fear of death and the realm of the dead that so many fear. Ask God to open the doors for the completion of the translation of the New Testament in the Somau Garia language. The Gospel According to Mark is in use, the rest of the NT remains to be translated. Ask God to provide for our return to PNG in His time, in His power, for His purpose. Thank God for people who are hard at work drafting and preparing further books for translation. Thank God for mission partners who currently support this ministry. Praise God for his compassion, for using his power to reconcile, heal, comfort, and establish his followers with life. Many thanks to those of you who are moving with us into the trenches, standing in the gap, making intercession for a people whom God loves and desires to redeem. This entry was posted in Please Pray and tagged Bible translation, intercession, missionaries, missions, Papua New Guinea, Somau Garia, transformation. Bookmark the permalink.